The ideal ferret diet is a somewhat controversial area, with the standard recommendation that cat food is fine being questioned and ferret specific diets becoming more widely available. Ferrets have unique feeding requirements, which are now finally being addressed by commercial pet food manufacturers. For many years, the common recommendation was to feed good quality dry cat or kitten food, but that recommendation is now considered out-of-date. Ferrets, like cats, are carnivores, but food passes through the digestive system of a ferret very quickly, and they lack the ability to derive much nutrition from plant matter. For this reason, a ferret diet must be high in animal protein, relatively high in fat, and low in fiber. All foods, including foods intended solely for ferrets, are not created equally, so be careful what you are feeding your ferret. Ferrets have a quick metabolism along with a short digestive system, so need to eat frequently (usually every 3-4 hours). zSB(3,3) It is best to have food available constantly. Most ferrets will eat only enough to meet their needs, and will not become obese if allowed constant access to good quality food. Fresh, clean water is also a necessity at all times. If you are having a problem with your ferret gaining too much weight, check with a vet to rule out a medical problem and for advice on meeting their diet needs while maintaining a good weight. Dry foods are the most convenient choice, as they can be left available at all times without concern of spoilage. Canned ferret food can be given as a treat or supplement, but only occasionally. As a basic rule, ferrets need a diet that is a minimum of 34-36% protein and approximately 20% fat (and low fiber). However, the source of protein and other nutrients is as important as the quantity. There are several ferret diets available now, and some are considered better than others. Good diets tend to be expensive, but are worth it. Some foods are simply modified cat or mink diets, which may be no more appropriate than a high quality cat food. Just be careful and check the labels. Be warned that fish based diets tend to make the litter pan smelly, and some ferrets may not like them. 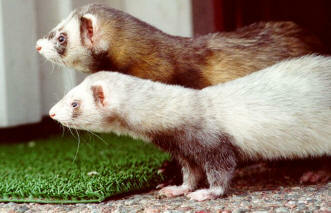 A diet that is often recommended is Totally Ferret, which comes in active and older ferret formulas. ZuPreem also makes a good premium ferret diet. The Ferret Store carries its own premium diet which is well formulated, along with a variety of other premium ferret diets. TheFerretStore.com provides an very nice comparison chart to allow you to visually compare a huge range of foods. Any diet changes should be made gradually, mixing in the new food with the old and gradually reducing the amount of the old diet. It is often a good idea to use a mixture of foods starting when ferrets are young, as some can be stubborn about trying new foods, which may create problems if their current food becomes unavailable. When you look at the nutrient analysis, you will find the minimum levels of protein and fat in the diet. But you also need to carefully examine the ingredient list. Protein can come from a variety of sources, including plant matter, so you need to make sure the bulk of the protein is derived from meat and poultry products. Chicken or poultry meal and egg are high quality protein sources and are good choices. Many pet foods, especially the inexpensive types, use corn as a major source of protein, but this will be largely indigestible to your ferret. Also avoid foods with high quantities of carbohydrates or sugars. The list of ingredients is based on their percentages in the food, from greatest to least. Your best bet is to look for diets with meat or egg products making up at least 3 or 4 of the first 6 listed ingredients. Also, chicken fat is considered a better-balanced fat source than other animal sources. As the science of ferret nutrition improves, there is little doubt that premium ferret diets are the best to feed ferrets. Still, if you are unable to find a good quality ferret food (consider ordering online if nothing else) you may have to settle for cat food. If so, make sure it is a premium diet (e.g. Eukanuba, Innova). Use a kitten food, high in protein, but as your ferret gets a bit older (4 years or so), switch to an adult food. Again, you must check labels, and pick foods with animal proteins at the top of the ingredient list and low in sugar. Avoid the so-called grocery store brands at all costs, as these are typically very poor for ferrets. Treat should be given in moderation. There are vitamin supplements for ferrets and hairball remedies which ferrets generally love, and they provide some benefits. These make good training aids and treats, but should be used sparingly. Other treats include eggs (hard boiled, scrambled) and cooked meats. These should be fed in very small amounts. Ferrets tend to love raisins and other fruits, but these should given infrequently, and other sweets avoided.